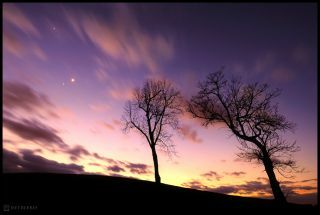 This image from 2012 shows a close encounter between Jupiter and Venus in the sky over West Chester, Pennsylvania. On Tuesday (June 30) these two planets will come to within two-thirds of the apparent size of the full moon from each other. The celestial highlight of the month is actually a drama that has been building all through June: The two brightest planets in our sky — Venus and Jupiter — have been slowly approaching each other. At the start of the month, the two planets were separated in the sky by 21 degrees. From your outstretched hand, your clenched fist is equal to roughly 10 degrees, so at the beginning of June, Venus and Jupiter appeared about "two fists" apart. But ever since, they have been getting progressively closer to each other by an average of about 0.7 degrees each evening, until finally, tonight (June 30), they will be a scant 20 arc minutes (0.33 degrees) apart; the equivalent of two-thirds of the apparent width of the moon. Conjunctions between Venus and Jupiter are far from rare events. According to astronomer Jean Meeus, a highly regarded calculator of planetary motions, they occur at mean intervals of 13 months. But this is not quite correct, because every once in a while a triple conjunction between these two planets will occur, with three conjunctions taking place over a time span of four months. For this to happen, Venus must be close to inferior conjunction (when it's positioned between Earth and the sun). It then appears to temporarily reverse its normal eastward path against the background stars, turning back toward the west. If Jupiter happens to be in the general vicinity, Venus will pass the largest planet while heading east, pass it again after it has turned back to the west and pass it yet a third and final time when it resumes its normal eastward course. What makes this month's Venus-Jupiter conjunction rather special is how unusually close they will approach each other. Looking into the future, I've found that over the next 100 years, up until the year 2115, Venus and Jupiter come to within 20 arc minutes or less of each other just 26 times. In fact, on November 22, 2065, Venus will actually appear to cross in front of Jupiter! Too bad that the two planets will be only 8 degrees from the sun when this exceedingly rare event takes place, robbing us of an amazing visual spectacle. Interestingly, there is also a 24-year cycle for Venus-Jupiter conjunctions associated with their sidereal revolution periods — "sidereal" meaning "with respect to the stars." The sidereal period is 224.7008 days for Venus, 365.2564 days for Earth and 4332.5894 days for Jupiter. As it turns out, 39 revolutions of Venus are almost precisely equal to 24 revolutions of Earth and two revolutions for Jupiter. So after 24 years, the circumstances of a particular Venus-Jupiter conjunction will appear to repeat under almost identical conditions. But such 24-year cycles cannot go on forever, mainly because Venus cannot stray more than 47 degrees from the sun. Eventually, the two planets must break off and go their separate ways. That's why in early July of 2039, the two planets will get no closer than 8 degrees from each other in the evening sky; Venus will not be able to travel far enough to the east of the sun in order to reach Jupiter. So not only is this month's Venus-Jupiter pairing the closest in this particular 24-year cyclic pattern, it is also the last.